The Hawk T1 is an advanced flying training aircraft used to teach operational tactics, air-to-air and air-to-ground firing, air combat and low-level operating procedures. 100 Squadron Hawks, based at RAF Leeming are also used in roles such as target facilities and specialist electronic warfare training. The Royal Navy also operate the Hawk for use as aerial targets for the training of ships gunners and radar operators etc. The Royal Air Force's International Display Team, the Red Arrows also use the Hawk. The Hawk is one of the most sucessful British aircraft in recent history, with many foreign air arms flying the Hawk including: Abu Dhabi, Finland, Kenya, Saudi Arabia, South Korea, Switzerland and the United States Navy. A new Hawk, called the Hawk 128 has been ordered for the RAF which has a more powerful engine, 'glass cockpit' (three, full colour, multi-function displays ), etc. The Hawk 128 will be used by both RAF and RN pilots for fast-jet aircrew training and will replace the existing Hawk T1 aircraft of Nos 19 and 208 (Reserve) Squadrons at RAF Valley. It will train aircrew for Harrier, Tornado, Typhoon and the future Joint Combat Aircraft. The Hawk T1 can be armed with one 30mm Aden cannon pack and up to 5,600lb (2,540kg) of underwing stores (rockets, bombs and missiles). 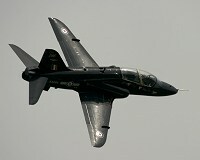 The 2005 Display Hawk T1 is from 208(R) Squadron based at RAF Valley. There is also a second Display Hawk T1 from 100 Squadron based at RAF Leeming. The badge on the tail fin is from the 1930's when 208 Sqn was serving in the Middle East. The wings denote flight and the eye is the Egyption god 'Horus' which together depict the Squadron's role of aerial reconnaissance. The verb 'to look' in Arabic is 'shouf' which over the years has been mispronounced as 'shufti' by English speakers. Thus, 208 Sqn came to be known as the 'Flying Shuftis'. The 2005 Hawk T1 (208 Sqn) Display Pilot is Flight Lieutenant Philip Diacon. Flight Lieutenant Philip Diacon, aged 32, is the eldest of 5 children. He was educated at Wood Green school in Witney, Oxfordshire afterwhich he joined the RAF as a sponsored student reading Aeronautical Engineering with German at Bath University. He completed his elementary training on the Bulldog TMK1 at Bristol University Air Squadron before beginning Initial Officer Training at the Royal Air Force College Cranwell in mid 1995. Following flying training on the Tucano and the Hawk he was posted to the Tornado GR4 operational conversion unit and then to 12(B) Squadron at RAF Lossiemouth to fly the strike/attack role. During his 2 and a half year tour, Phil participated in exercises on Norway, North America, Egypt, and Canada and flew operational missions during deployments to the Middle East. In 2003 he completes the Qualified Flying Instructors (QFI) course and currently teaches students to fly the Hawk at08 Sqn at RAF Valley in Anglesey. Phil enjoys many outdoor sports including mountain biking, mountaineering, wind surfing, and running. RAF Valley is home to No 4 Flying Training School, which is responsible for the training of Royal Air Force and Royal Navy fast-jet pilots. 208 (R) Squadron teaches basic handling of the Hawk. 19(R) Squadron teaches tactics and engineering skills. RAF Valley is also home to C Flight, 22 Squadron, whose Sea King helicopters are some of the busiest Search & Rescue assets in the UK. The Search & Rescue Training Unit use the Griffin to teach future RAF helicopter pilots how to fly rescue sorties. 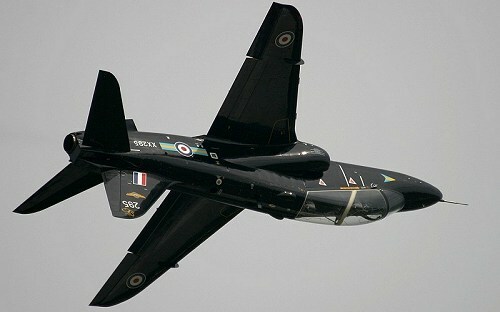 More details on the Hawk T1 can be found on the RAF website. A second Hawk T1 display from 100 Squadron flown by Flight Lieutenant Dave Harvey can also be seen on the 2005 display circuit.